Michelle Ewing, a 20-year burn care veteran, prepares for surgery. “We’re just a family up here,” she says of the staff and patients on the burn unit­. Photo by Joe Howell. Burn injuries can happen to anyone. Each burn patient’s story is unique, but they all start the same: with an unplanned event. So sudden. Often tragic. Always painful. The severe burn patient is a significant challenge medically and often requires numerous surgeries. They have large open wounds, have difficulty maintaining body temperature and fluids, are at high risk of infection, and require significant wound care, physical therapy and occupational therapy. Managing kidney, heart and lung function is difficult, and depending on how the accident occurred, patients sometimes have other injuries in addition to their burns. Once a burn patient’s immediate medical needs are managed, the emotional healing begins. Each burn patient has his own journey, but it’s a journey that alters life forever. Ethan Monsalve has an air of confidence on the football field. When you meet him, the 14-year-old’s green eyes and bright smile get your attention—but it’s only a split second until you also notice the rough, wrinkled appearance of deep scars across his chin and neck. When he is running to catch a pass during football practice, his goal isn’t to stand out. It’s to blend in. At age 6, Ethan was standing near a bonfire on Thanksgiving Day when someone added an accelerant to the flame. He was engulfed in the fire, which burned nearly 40 percent of his body. He was airlifted from northwestern Tennessee to Vanderbilt, where he ultimately underwent nearly 20 surgeries and multiple skin grafts. When the lives of plastic and reconstructive surgeons and their patients intersect, bonds can be built that are nearly as close as family. The journey certainly changes patients and families. Some say it changes them for the better. Ethan and his mother, Sara LaPorte, are from Los Angeles; they had only been visiting friends in Tennessee at the time of Ethan’s burn injury. But that Thanksgiving visit turned into Christmas and New Year’s at Vanderbilt’s intensive care unit and burn unit. The ongoing care he received at Vanderbilt motivated his family to move from Los Angeles to Tennessee. Now 14, Ethan still has regular checkups for the injuries he sustained and may require future surgeries, his body forever marked by that incident eight years ago. It became apparent that Tennessee needed a burn unit in 1978 during the aftermath of a 24-car train derailment in the downtown area of Waverly, Tennessee, about 60 miles west of Nashville. Two days after the accident, a tank-car containing 28,000 gallons of liquid petroleum gasoline exploded, which killed six people instantly and ultimately claimed 16 lives, including the town’s fire chief and police chief. In addition to the initial blast, the explosion started numerous fires in the area. More than 100 victims were transported to burn centers in other states, and about 50 victims came to Vanderbilt from this event, known as the Waverly Train Disaster. “It was a disaster for sure,” said Bruce Shack, M.D., who was chief resident of General Surgery at the time and is now professor and chair of the Department of Plastic Surgery. He and his colleagues reorganized the Surgical Intensive Care Unit, then located on the fourth floor of Medical Center North, to accommodate the inundation of burn victims. The chief of Plastic Surgery then was J.B. Lynch, M.D. He had substantial prior experience with burn patients and had been instrumental in opening the Shriners Burn Hospital for Children in Galveston, Texas. Prior to 1983, burn victims in the Southeast were transported to burn centers in Louisville, Kentucky, Birmingham, Alabama, or Cincinnati, Ohio. Following the Waverly Train Disaster, Lynch and others began the work of gaining community support for a burn unit at Vanderbilt, and in November 1983, the Vanderbilt Regional Burn Center opened its doors. Lynch, who died last year, served as the first medical director of the Burn Center, with Shack overseeing the intensive care unit. For 22 years, the Burn Center resided in the same space that the train disaster victims once occupied. In 2005, it moved to the 11th floor of Vanderbilt University Hospital (VUH), offering 25 beds to the nearly 700 burn victims admitted annually from middle and east Tennessee and the surrounding states. Dedicated burn centers are uniquely designed to care for large burns and wounds and are staffed with providers who know the latest in burn and wound care. Today, Vanderbilt’s Burn Center is comprised of a team that is solely dedicated to the complex physical, medical and emotional needs of these critically injured patients. Plastic surgeons, general surgeons, intensive care physicians, anesthesiologists, nurses and nurse practitioners, wound care specialists, physical and occupational therapists, respiratory therapists, social workers and case management staff care for some of the sickest and most medically challenging patients in the hospital, and among this team, a common theme prevails: a passion and a calling for burn care. Michelle Ewing and Maria Ewing, who are not related, have spent a combined 36 years in the Burn Center. As veteran burn care specialists, they see patients in the outpatient clinic and assist in nearly all the burn surgeries. “I just love it, the satisfaction you get when you see someone who’s brought in and you think ‘they aren’t going to make it,’ and you go into surgery with them time and time again, and then one day you look up and they are getting discharged, there’s just nothing like it,” said Maria, who has worked in burn care for 16 years. The majority of the outpatient clinic’s 3,000 annual visits are evaluations for burn injuries and follow-up care for previously hospitalized patients. Some patients were cooking dinner when the kitchen caught fire or grease spilled down their body; some were cooking methamphetamine and caused an explosion. Injuries stemming from bonfires, home fires, burning brush, high voltage electrical burns, smoking cigarettes on home oxygen, hot liquid scalds, smoke inhalation, and car and plane crashes can cause someone to require the intricate care that only a specialized burn center can provide. “Burns don’t play favorites; they can happen to anyone at any age. No one is immune,” Summitt said. Most often, burn patients come to Vanderbilt as direct admissions to the unit on 11 South of VUH, either through transport from an outlying hospital or local EMS. The patient’s first stop is the hydrotherapy room for initial evaluation and resuscitation. The wounds are assessed and a care plan is made. Finding the right time to operate is a delicate balance, Summitt says. Operate too soon and the patient will not be ready, but wait too long, and the burn will start to cause other medical issues. Hydrotherapy is a small, windowless room where daily wound care takes place, where the patient lays in a metal tub with shower hoses overhead and endures the painful but necessary dressing changes. Bandages are carefully soaked off, wounds are assessed and cleaned, and new dressings are placed. Depending on the extent of the wounds, this process can take up to four hours. The room is kept at a minimum of 80 degrees but is often adjusted to 100-degree temperatures in order to keep the patient’s body temperature controlled. While a nurse helps manage the pain with medication, the dressing changes are in the hands of Wound Care Specialist Mike Elam or “hydro Mike” as he’s affectionately called by his colleagues, who say he has a way of connecting with his patients and making the painful wound care experience a little more tolerable. “It’s my calling,” said Elam, who has served the Burn Center for more than a decade and has treated nearly all of Vanderbilt’s most severe burn patients for the last 10 years, from newborns to elderly patients and everyone in between. Physical and occupational therapists work with patients to strengthen and improve or regain movement and range of motion. Because burns can greatly impact functionality, therapy is vital to prevent disability, keep skin grafts from contracting and help the patient acclimate to daily tasks. 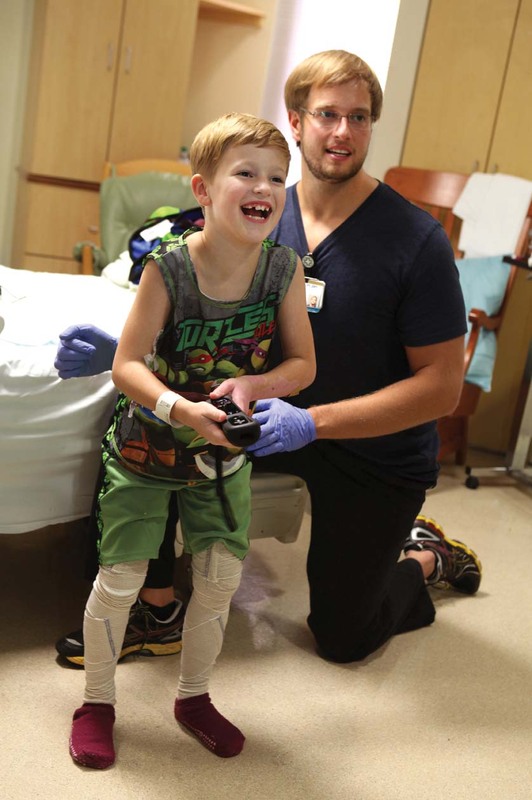 The Burn Center recently began using a Nintendo Wii video game console, a gift from the Chattanooga Firefighter’s Association, as part of therapy for some patients, particularly pediatric patients who are having difficulty regaining mobility after suffering burn injuries. Eight-year-old Gavin Chitwood and therapist Trae Williams, P.T., DPT, use the Wii device as physical therapy. Photo by Anne Rayner. For 8-year-old Gavin Chitwood the Nintendo Wii was more than a game; it was a necessary distraction while recovering from his injury. Last summer, he was near a campfire when he was burned on his legs and torso. He had third-degree burns and needed surgery, along with several skin grafts. Going through physical therapy at the Vanderbilt Burn Center can be a particularly challenging process for children. 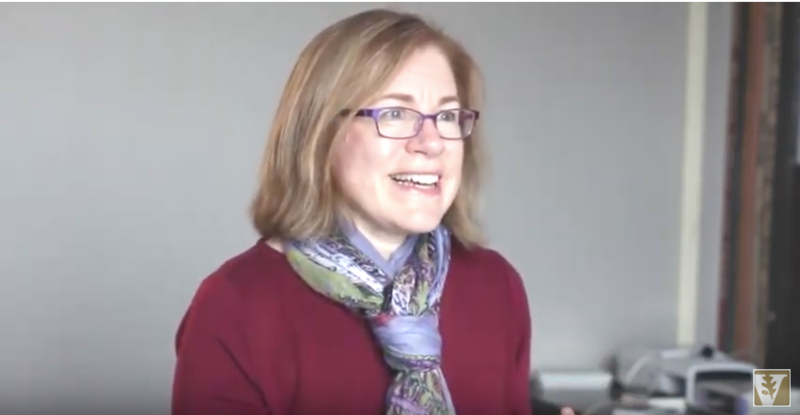 “With adult patients you can explain the need for therapy. You can tell them that in order for them to return to their lives in a meaningful way then need to participate with therapy. This often means doing things which are uncomfortable,” said Gavin’s physical therapist, Trae Williams. 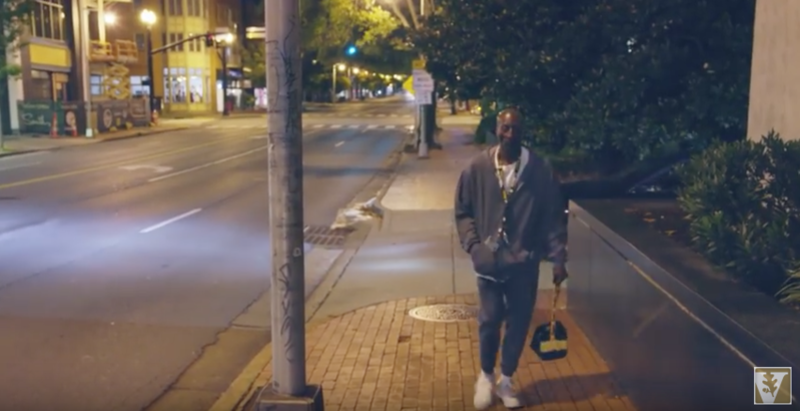 When conventional exercises didn’t work, his physical therapist at Vanderbilt decided to give the Nintendo a try, and that’s when Gavin began to make real progress in his recovery. “When we began therapy with Gavin he was unable to stand due to the pain from his leg burns. However, he also had an arm burn that was less painful so we started using games on the Wii which required him to use that arm in a meaningful way,” Williams said. As his interest in using the Wii grew and his burn on his legs healed, Gavin progressed to games that were more challenging and required him to stand, such as bowling. Between wound care and therapy can often be multiple surgeries and skin grafting. Standard burn care practice includes early excision of burns followed by grafting, a process where healthy skin is taken from another place on the body and placed over the injured area. Contracture is common, particularly if proper follow-up care and therapy recommendations are not properly followed. “Lots of operations can be involved in reconstructing a burn patient,” Summitt said. 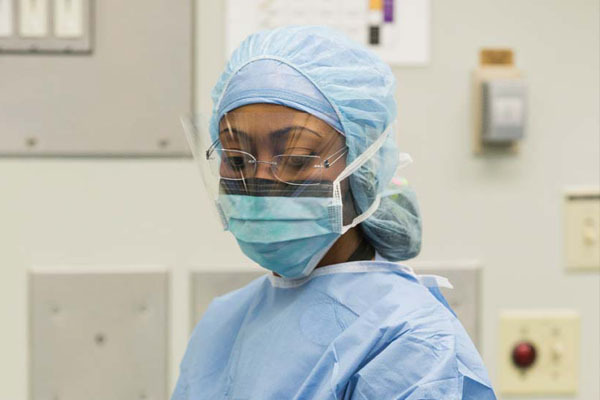 At Vanderbilt, three plastic surgeons and one critical care surgeon are dedicated to the more than 500 burn surgeries annually, and every surgical resident completes a rotation in burn care during their second year of residency. While the initial emphasis is on the physical recovery and rehabilitation of the patient, a crucial aspect of care is addressing the emotional trauma the patient has experienced. Dan Ramage, a licensed clinical social worker, assesses patients who may be experiencing post-traumatic stress disorder and provides services such as counseling, drug and alcohol intervention assistance and discharge planning, and also services related to child abuse or domestic abuse when applicable. Ramage counsels patients while in the hospital and also on an outpatient basis, and refers patients for further psychiatric evaluation when needed. When patients are discharged from the Vanderbilt Burn Center, they receive a round of applause from the staff for the work the patient has done to get to that point, and they cheer them on for the work that is just beginning.